Ex-AMD exec Chris Hook, now head of Discrete Graphics and Visual Technologies Marketing at Intel, has confirmed that Intel is still working on implementing Adaptive Sync technology. In related news, Intel yesterday released a graphics driver update for Windows 10 with a number of new features and fixes. A portion of a conversation with Chris Hook was shared by a Redditor a few hours ago. 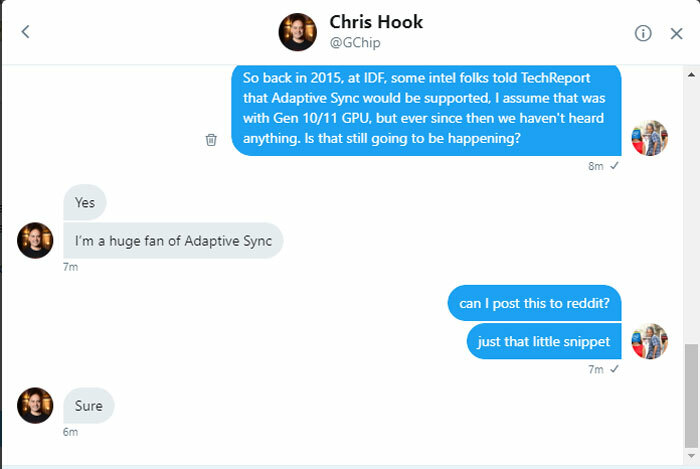 The chat was about a 2015 TechReport article where it was claimed Intel would support Vesa Adaptive Sync displays in an upcoming GPU architecture. It was noted that Intel is still shipping the same gen 9.5 graphics, so the Redditor wondered if Adaptive Sync tech would be delivered alongside a gen 10 or 11 Intel GPU. Hook's answer to that query was a succinct 'Yes". Then he added, reaffirming there would be pressure in this direction, if needed, "I'm a huge fan of Adaptive Sync". HardOCP notes that there could be "far-reaching implications if Intel enables Adaptive Sync technology on their CPUs". Recently people have been playing with a technique that allows an Nvidia GPU's frame buffer to be copied to an AMD APU to enable AMD FreeSync technology on a compatible display connected to the APU (with some latency impact). Yes, it means, for a limited number of people Nvidia GPUs can do FreeSync. Just think, if the proviso wasn't the AMD APU but any modern Intel CPU - it would be interesting to see Nvidia's reaction. While we are on the topic of Intel graphics it is worth mentioning the recent 24.20.100.6286 driver update. This is the launch driver for Strange Brigade and Pro Evolution Soccer 2019. Furthermore, it includes performance improvements and optimizations for World of Warcraft: Battle for Azeroth (for both DirectX 11 and 12 versions) and Jurassic World Evolution on 6th Generation Intel Core processors or higher. 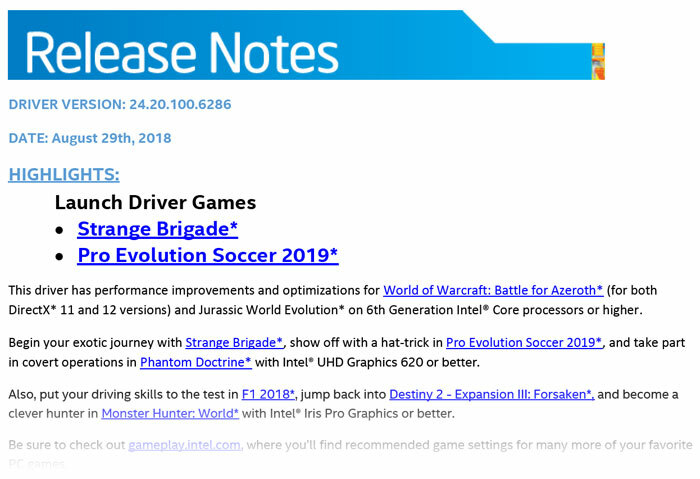 Those with Intel Iris Pro Graphics or better will enjoy support in F1 2018, Destiny 2 - Expansion III: Forsaken, and Monster Hunter: World. Outside of games, there are media streaming improvements using the AVC codec at low bitrates for 6th Generation Intel Core processors or higher, power optimisations, and security fixes. The driver fixes a few other things too, such as the Steam overlay in Dota 2 in Vulkan mode, and spruces up graphics anomalies in Titanfall 2, Minecraft, and Lego Ninjago. You can download this Windows 10 driver and read through the full release notes via the link above. Can't wait to see nVidia to cave in on the free technology they charge premium on it. Does anyone actually game using Intel graphics?! Some probably do, people don't only play the most recent AAA blockbusters. If/when Intel enter the discrete GPU market, then maybe more people will, but probably not. I reckon there will be a few adopters when they release their dGPU in 2020.